At the recent Wines of Spain tasting, their annual show in London, there were many excellent wines of every description. However, my Wine of the Show was Rebel.lia. It’s from the excellent Bodegas Vegalfaro, in the heart of the DOP Utiel-Requena region of Spain, inland from València. Regular readers of these pages will know of my love for all things Valèncian, and you can find out more about DOP Utiel-Requena from my previous articles. Vegalfaro has 60 ha of vineyards and is certified organic. Furthermore, since its creation in 1999, their vineyards have never had any chemical treatments. They produce an excellent range of wines, including those at Vino Pago level, which is now Spain’s highest quality classification. Meanwhile, this young red wine is one of the very best blended wines available in the region. Not only has it won some distinguished awards; it’s also incredible value for money. Rebel.lia is a blend of 30% Bobal, with 35% Garnacha Tintorera (Grenache) and 35% Tempranillo. These three classic Spanish grape varieties complement one another well. There’s a splash of Merlot also included in this particular year. Bobal is a Spanish grape variety that can be brilliant in its own right. However, it also makes a great blending partner. 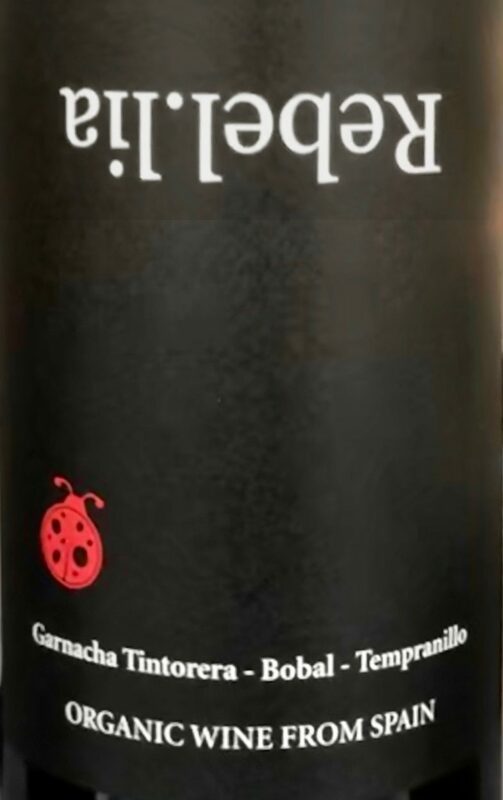 Unlike Garnacha and Tempranillo, it produces modest alcohol and has high acidity and tannins together with vivid colour. These valuable qualities are put to good use here. The grapes come from the Casa Alfaro vineyard, on limestone and gravel soils. The different varieties are blended after vinification, then get four months maturation in mostly Hungarian oak barrels. 2017 was a drought year throughout most of Europe, and Utiel-Requena was no exception. Production was smaller than usual but of high quality. Arguably it’s one of the best vintages in recent years. Utiel-Requena is hot and arid in any case; preventing fungal diseases, while the vines relied on soil water reserves to survive and thrive. The result is splendid. It’s a deep purple colour and no shrinking violet at 14.5%. There’s no overt alcoholic heat and the balance between bright acidity, fruit and alcohol are impeccable. Enticing smoky red berry fruit on the nose gives way to a palate of cherry and plum, backed by a smidge of cocoa and brown spices. Polished tannins offer a velvety mouthfeel before a long fade on the finish. In short, it’s a harmonious and satisfying blend without edges. Food-wise, you’d expect meat to be a good partner. Lamb, whether chops or roast, is particularly good. As we head into barbeque season, then all manner of grilled meats will work a treat. An authentic Valèncian Paella, based on rabbit and snails, also comes to mind. The nearby town of Requena is famous for its sausages too, so think Chorizo and Sobrasada. Rebel.lia is £9.95 at Vintage Roots. I didn’t know how much this wine cost when I first tasted it and had it in the £15-£18 bracket. Enough said. As Lance Pigott, co-founder of Vintage Roots said to me at Wines of Spain, it’s a head-turner, and not just because the writing on the label is upside down! Afterwards, I put my money where my mouth is and bought it online. I recommend you do the same. With 100,000 bottles made, there’s plenty to go round!